OTONEWS - ASEAN NCAP, institutions that perform security testing cars in ASEAN announced the rankings Daihatsu Sirion. Sirion get a pretty good rating that is good for a four-star adult occupant protection and child. 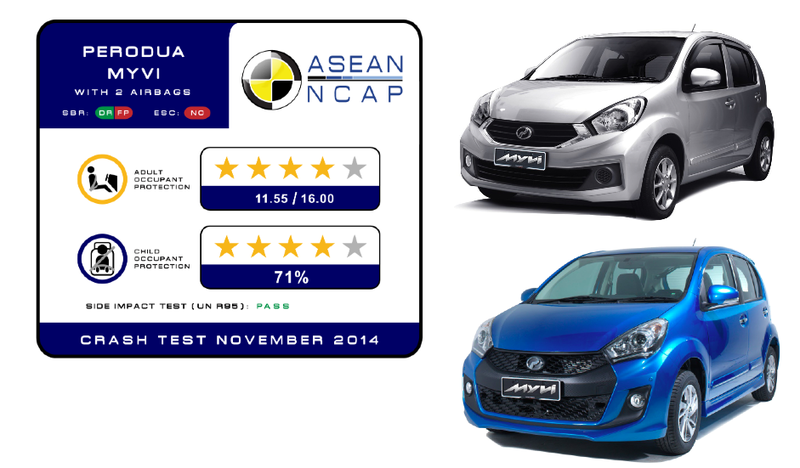 ASEAN NCAP test Perodua Myvi also called Sirion in Indonesia. Sirion is manufactured in Malaysia. Achieved the same star Xenia / Avanza. For the category of Adult Occupant Protection (AOP) Sirion, grabbing 11:55 16:00 Point of the total points, whereas for Child Occupant Protection (COP) scored 34.83 out of a total of 49 or 71%. By using the New Myvi variant 1300 G models 2015, Test Hit (Crash Test) conducted frontally with a maximum speed of 64 km / h by the Malaysian Institute of Road Safety Research (MIROS) 3 PC Lab in Melaka, Selangor. The complete results of the ASEAN NCAP New Sirion for category Child Occupant Protection (COP) includes Dynamic Test with a value of 16.83 from the maximum value 24, CRS Based Assessment get maximum value 12, Vehicle-Based Assessment scored 6 of the value of a maximum of 13, so that the total value obtained amounted to 34.83 from a total of 49 or 71%. No Comment "Hit Test, Daihatsu Sirion Get 4 Stars"